Improve enterprise security and risk posture while ensuring regulatory compliance. Effective, scalable security that is easy to use, easy to deploy and easy to manage. Efficient and affordable security with lower investment and management overhead. Deliver modern security solutions that support evolving enterprise needs, at scale. Securing democracy through democratized security. Cloud and mobility are driving federal agencies to modernize their IT. But like all major shifts, IT modernization is not without its challenges. To truly modernize, federal agencies must overcome the compliance confusion, gain deep visibility into devices, solve the PIV/CAC conundrum and escape legacy limbo. 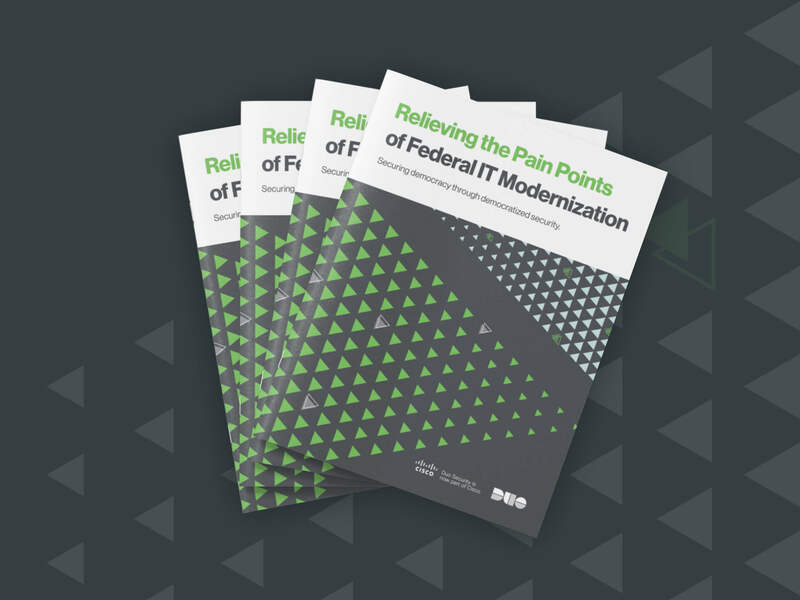 Download our ebook, “Relieving the Pain Points of Federal IT Modernization,” and learn how federal agencies can find relief from the pain points they encounter as part of their IT modernization initiatives. We were previously trying to do this through a combination of five other products. The fact that one product can provide this level of granular access control is really awesome. Duo has offerings to help you throughout your journey to a complete zero-trust security model. Our trusted access solution features everything you need to protect your applications and data at scale. Verify the identity of all users with effective, strong authentication (two-factor authentication) before granting access to corporate applications and resources. Gain visibility into every device used to access corporate applications, whether or not the device is corporate-managed, and without the use of onerous device management agents. Inspect all devices used to access corporate applications and resources in real time, at the time of access, to determine their security posture and trustworthiness. Protect every application by defining policies that limit access to the users and devices that meet the organization’s risk tolerance levels. Grant users secure access to all protected applications (on-premises or cloud-based) through a uniform, frictionless interface accessible from anywhere. We’re proud to protect the missions of some of the top companies and institutions around the world. See Why Top Companies Love Duo. Duo Beyond creates an invisible and open gate that authorized users with trusted devices never have to see, the gate only materializes and closes when the device trust standards are not met. Are you ready to embark upon your journey to trusted access? 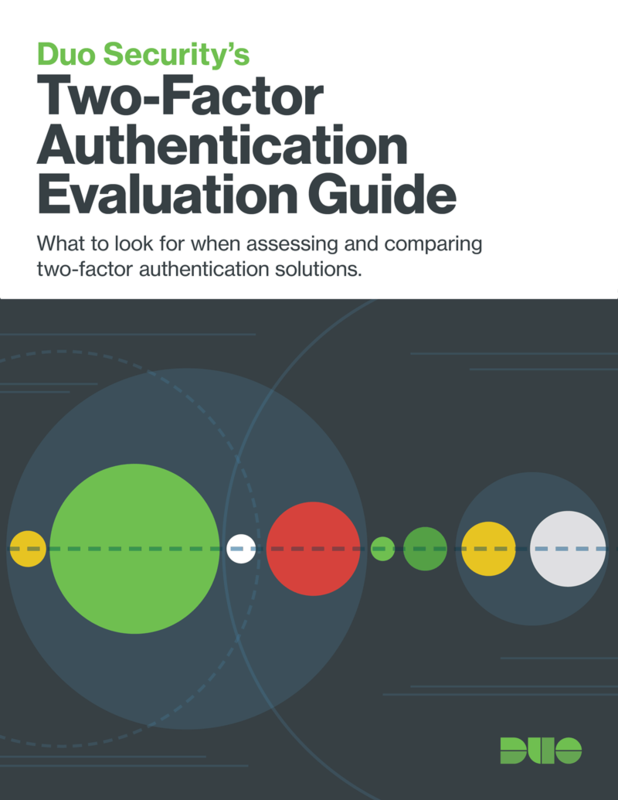 In our Two-Factor Authentication Evaluation Guide, you'll learn how best to evaluate a 2FA solution. The next stop: a complete zero-trust security platform.